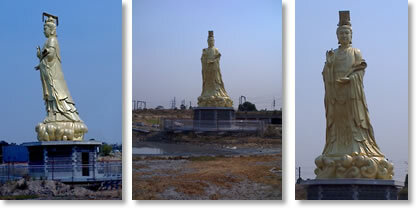 THE remarkable transformation of a vacant Maribyrnong River site into a Buddhist temple complex began with a 16-metre statue of the Heavenly Queen. Sydenham train line passengers have a perfect view of the statue, which is just south of the railway line, opposite the Newells Paddock site. The stainless steel, gold-painted statue was designed and made in Nanjing, China. Heavenly Queen, also known as 'Mazu', Lin Mo Liang A.D. 960-987) was born on Meizhou Island in FuJian Province during the Sung Dynasty in China. The six-building 35,930-square-metre site was remediated and sold to the Heavenly Queen Society. Includes a memorial hall, souvenir shop, office, exhibition centre, drum tower, a secondary temple, bell tower, lake pavilion and extensive Chinese gardens.